The interactive Urban Displacement Project map, released today by a Berkeley team, graduate students from New York University's Center for Urban Science and Progress (CUSP), and the Local Initiatives Support Corporation's (LISC) New York City office (LISC NYC), shows that 12 percent of low-income neighborhoods are experiencing ongoing or advanced gentrification and an additional 9 percent are experiencing displacement – households being forced to leave—without any gentrification at all. When residents are displaced from New York City, they have few choices, since a majority of the suburbs have gentrified and grown increasingly exclusionary toward low-income residents. "Our work shows that the housing affordability crisis is displacing low-income families throughout the New York region, a pattern that is being replicated in other high-cost regions around the country," says UC Berkeley city and regional planning professor Karen Chapple. In 2016, more than one-third of low-income households lived in low-income neighborhoods at risk of or already experiencing displacement and gentrification pressures, comprising 24 percent of the New York metro area's census tracts. The online map allows residents, neighborhood groups and governments to assess where their neighborhoods are in terms of the risk and actual occurrence of gentrification and displacement. In the San Francisco Bay Area, many different stakeholders have used similar interactive maps produced by the Urban Displacement Project: residents have shown the maps at city council meetings to raise awareness of neighborhood change, cities have asked developers to study the maps to assess the potential impacts of their proposed buildings, and the federal government has used the maps to enact anti-displacement preference policies for subsidized housing waitlists. "LISC NYC applauds the creation of these interactive maps with detailed data to enable community-based organizations and policy makers in the New York metro region to assess the risk of displacement of low-income residents on a neighborhood level. 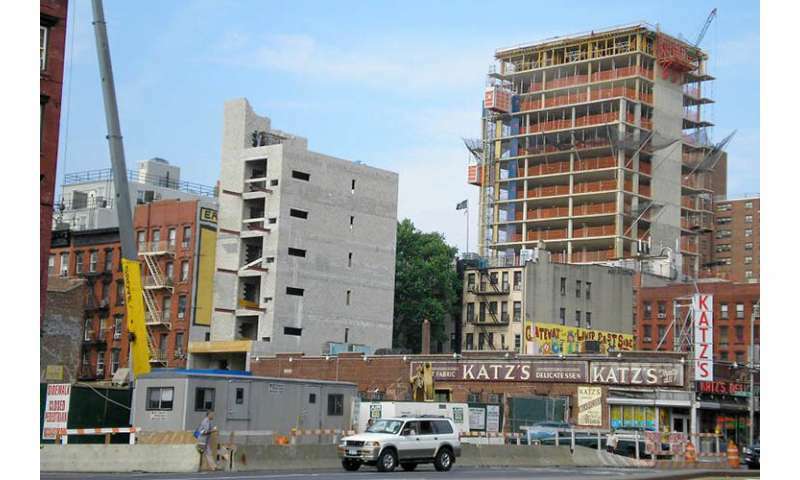 With this tool, advocates, elected officials, agency officials and researchers will be able to better target affordable housing preservation and development initiatives and anti-displacement efforts," said LISC NYC Deputy Director Eva Neubauer Alligood. The Urban Displacement Project map also serves as a regional early-warning system at the census tract level. Overall, 10 percent of neighborhoods, with almost 550,000 low-income households, are vulnerable to gentrification, based on the availability of affordable housing as well as presence of residents who are vulnerable in terms of income, education, renter status, or race/ethnicity. These maps can be helpful in identifying tenant protection strategies for low-income residents living in places such as the Bronx and Newark where many residents are experiencing displacement in neighborhoods that lack signs of significant investment. Subsidized housing and tenant protections such as rent control and just-cause eviction ordinances can be effective tools for stabilizing communities, says Chapple, yet the regional nature of the housing and jobs markets means that some local solutions are insufficient to address the full crisis. Says Moses Gates, Vice President for Housing and Neighborhood Planning at the Regional Plan Association: "Even if New York City can protect its low-income renters in gentrifying neighborhoods, that won't necessarily ease the displacement pressures on the other communities throughout the region which are experiencing similar issues of rising rents and fewer housing choices." New York City recently opened a new regional planning division to help locals understand these patterns. The need for new and preserved affordable housing is clear, given rising rent burdens, homelessness, loss of rent-regulated housing, public housing deterioration, and more. New York State is taking steps toward supporting vulnerable communities by investing $20 billion to combat homelessness and preserve and expand new affordable housing across the state. In the recently enacted budget of FY2020, New York State has made it illegal for landlords to refuse to rent to current or prospective tenants with public assistance vouchers and other lawful sources of income. New York City is also devoting sizable municipal resources through its Housing New York 2.0 plan which seeks to produce and preserve 300,000 units of affordable housing. New York City recently passed laws to prevent residential displacement including a Right to Counsel for tenants in housing court facing eviction and a law authorizing the local housing agency to create a Speculation Watch List to monitor sales of multifamily housing in order to measure highly leveraged sales as a predictor of predatory behavior. However, researchers caution that with new investment in the New York region from tech and other industries that bring high-wage, high-skilled jobs, as well as new policies like Opportunity Zones, it is even more critical for legislators to consider the potential impact on affordability and displacement in the region. "Our research suggests strategies that can help stabilize communities and keep them affordable," Chapple says, noting that the tools involve ways to produce and preserve subsidized units, and to promote community organizing. New York University Professor and Furman Center Faculty Director Ingrid Gould Ellen agrees: "These maps highlight the market pressures felt in many neighborhoods throughout the city. Our own research underscores the critical role of public housing and other place-based subsidized housing in ensuring the long-run diversity in gentrifying neighborhoods." LISC sponsored this research following its 2016 convening about neighborhood change, displacement, and equitable development, which showed the need for policy makers and community-based organizations working on displacement issues to have access to data to better understand long-term dynamics in the regional context. The project, which was vetted by nine different New York community organizations and educational institutions, relies exclusively on data from the U.S. Census (1990 and 2000 Decennial Census and American Community Survey (ACS) 2012-2016 5-year estimates) in order to make the approach readily replicable in communities across the U.S.